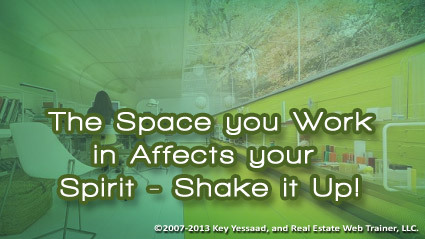 Your physical space dictates how you feel and work and one of the best ways to reenergize your spirit is to rearrange your office once a year, some even do it every six months. Don’t be afraid to paint your space, add artwork, move your furniture, or even change the whole orientation of your office. You have to remember that you are a ‘feeling being’ and you are affected by energy, and your surroundings do affect your mood. Ask a Family member, friends, or even get a decorator to help you rethink how you engage your physical space. One thing you will uncover as you start tackling your workspace is what you will find hidden in some pile of paperwork, deep inside drawers, or full of dust behind a desk or filing cabinet. Nurture your office, cubicle, work desk, and who you are with sounds and sights that allow you to love what you do and why you do it!